We’d love your help. 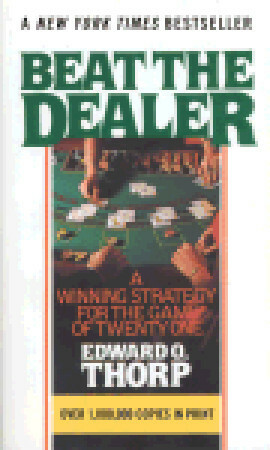 Let us know what’s wrong with this preview of Beat the Dealer by Edward O. Thorp. To ask other readers questions about Beat the Dealer, please sign up. Is this a good read? I'm not at all interested in becoming a card counter, or breaking the bank in Vegas, but this book is so infamous and so widely read that I want to experience it. Is this worth my time? Can someone find entertainment in this book, or would it be as boring as a person with no kitchen reading a cookbook? Where can I buy the epub version? Written in 1966, this is THE original gambling book. It started the blackjack craze in the 60s. Thorp was the scientist/math geek behind finding the best and most winning strategy for blackjack. He also backed up his theories by playing in the casinos and winning. Considering the book is almost 50 years old, its information still holds. Thorp focuses mostly on single deck blackjack and card counting as a strategy to gain a positive edge against the casino. Today, his strategies on blackjack make it the best game a gambler can play in casino. If you’ve ever seen someone with one of those white laminated credit card sized strategy cards, you can thank Mr. Thorp. The book explains the math behind the decisions presented on the card and why play is altered in certain situations. The book explains some card counting methods. Not everyone has the attention span to be a perfect counter, but having an understanding of how the systems work makes sitting at a table more interesting and entertaining. A re-read of Ben Mezrich’s book: Bringing Down the House would also be a worthwhile endeavor after reading Beat the Dealer. My only complaint with the book is some of the presentation of math at times reads like a technical paper and can get cumbersome with flipping back and forth between charts, but the information provided far outweighs some of the presentation issues. If you play blackjack, you must read this book. The author, E.O. Thorp invented the 'basic system' that every good blackjack player memorizes. Thorp invented and perfected card counting and the odds. Thorp actually was so effective, he changed the way casinos deal and manage blackjack. This is the original book on blackjack. All the others are derivatives of this one. The book settings are dated (would love to see an updated version) but the guidelines of beating blackjack are here. Thorp was the If you play blackjack, you must read this book. The author, E.O. Thorp invented the 'basic system' that every good blackjack player memorizes. Thorp invented and perfected card counting and the odds. Thorp actually was so effective, he changed the way casinos deal and manage blackjack. When this book was published in the mid-sixties, I'm sure it created quite a storm. I don't think it's applicable now for one simple reason: the book's system assumes there is only one deck in play. Unless you're ultra-rich, I doubt you'll find a single-deck table anywhere. It was an interesting artifact, but I think I will need to read a more modern book to deal with the multi-deck shoe games that are extant now. A good introduction to the basic analysis of blackjack, the so-called "basic strategy", which involves no need for card counting. This book is what put Edward Thorpe on the map, from obscure mathematics professor to the father of modern analysis of gambling. Much of the basic strategy is visualized as a type of automata, that explains when a player should stand, draw, or double. After going through the details of this strategy, Thorpe also goes through other strategies, which may include variati A good introduction to the basic analysis of blackjack, the so-called "basic strategy", which involves no need for card counting. This book is what put Edward Thorpe on the map, from obscure mathematics professor to the father of modern analysis of gambling. Much of the basic strategy is visualized as a type of automata, that explains when a player should stand, draw, or double. After going through the details of this strategy, Thorpe also goes through other strategies, which may include variations of simple point count system (mapping card type to values, perhaps binary, trinary) and aggregating these points in some way which directly feeds into a decision criterion linked to action and/or bet-sizes. These systems are usually explored through elaborate value/count/bet-size matrices, where each cell represents a possible 2 tuple card combination. Still lost some money on gambling haha. Definitely helped me to understand about casino and how to play black jack. I've pretty much finished reading the book a while ago, but there's still reference type study with it. I can consider it finished and get it off the current read list now..
An absolute classic, that even prompted legal battles between players and casinos. A must read for any blackjack player. This book was the center of a lot of drama over counting cards and what is to be considered cheating the game or casino. Like I said, a must read for all blackjack players. I had to read it for a Math class in college -- we were analyzing Black Jack. Not an easy read. Very technical and you will need to use sets of cards to experiment with the theory. Edward Oakley "Ed" Thorp (born 14 August 1932) is an American mathematics professor, author, hedge fund manager, and blackjack player best known as the "father of the wearable computer" after inventing the world's first wearable computer in 1961. He was a pioneer in modern applications of probability theory, including the harnessing of very small correlations for reliable financial gain[citation n Edward Oakley "Ed" Thorp (born 14 August 1932) is an American mathematics professor, author, hedge fund manager, and blackjack player best known as the "father of the wearable computer" after inventing the world's first wearable computer in 1961. He was a pioneer in modern applications of probability theory, including the harnessing of very small correlations for reliable financial gain.